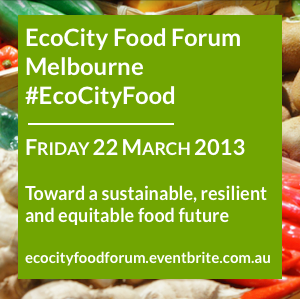 The free-to-attend EcoCity Food Forum is perfectly timed to take place immediately after the National Sustainable Food Summit in Melbourne, and will give participants the chance to continue building valuable connections, knowledge, capability and opportunities. At this point in time there are 111 places left but I can tell you that the event was only listed this morning and already 34 places have been snapped up. So get in while you can. Based on the design of successful ‘Unconferences’, Gathering ‘11 and CoMConnect (also with the City of Melbourne), The EcoCity Food Forum will be a full day of participant led conversations, presentations, workshops and planning sessions with passionate change makers and thought leaders from all over the city, around the state and across the country. Designed to maximise the exchange of knowledge and ideas, and to foster the development of relationships, the EcoCity Food Forum program will incorporate the World Café methodology and feature participant led sessions using Open Space Technologies. The day will start with a blank timetable that we'll populate with the talks and discussions the participants (yes, that means you!) want to lead and initiate. Our venue (TBC this week) will provide us with a multitude of adaptable spaces that can just as easily accommodate a plenary session for up to 150 people as well as a conversation between just a few. Once the timetable is populated it's up to you to decide which sessions you would like to participate in. We see the event emerging as a bridge to facilitate cross-sector collaboration by attracting a dynamic mix of academics, government ofﬁcials, business people, and community leaders - coming together to shape Melbourne's sustainable future.